Everyone who has had acne knows that the struggle is real. Annoying pimples, dry or super oily skin, red and irritated patches cause an emotional and physical pain, as well permanent scarring. That’s why, every teenager and adult who suffers from acne, literally runs to try out every new product introduced to the market. Ever since I started breaking out when I was 14, I tried every single treatment for my acne. Every gel, every toner, every promise and doctor’s prescription. When I was too young for makeup, I had to try every treatment available, until I bumped into Proactiv. 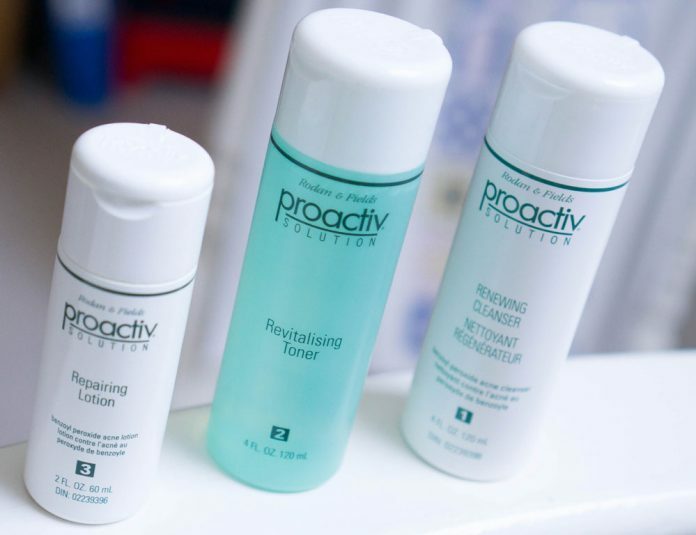 Proactiv is the old name, now called Proactiv +. Both of the old and new system are composed of 3 steps: the cleanser, the toner and the repair treatment or the moisturizer. Over the years, there have been some minor changes but the original ingredients stay the same. The three steps program is composed of a skin exfoliating cleanser, a pore targeting solution that contains benzoyl peroxide and a soothing moisturizer. The three steps program promises to clear skin and to fix the acne problem by regular use and application. Over time, I realized that the program was not doing me any good, and was too afraid to quit. So I tried to do some research. First, I wanted to know if it was just me. I mean this is what we always want to know when there is something wrong, am I the only one? And the internet gave me the answer: No. There were a lot of reviews and testimonials of different people from different age groups and with different acne types who were not seeing any benefit using the Proactiv + system. I also had to learn more about the ingredients. The ingredients were meant to treat acne, but were they actually doing my acne more harm than good? The cleanser: The first problem with this program is the cleanser. The cleanser exfoliates the skin using small beads and while this can feel a little too comforting and refreshing, it is not actually a very good thing to do to acne prone skin. In fact, exfoliating and scrubbing acne can be the worst thing to do. When you exfoliate the skin you are actually stripping it off from its first line of defence against bacteria. This makes your skin “naked” and exposed to pollutants. While the cleanser is supposed to clean and dry oil and sebum, it actually makes the skin dehydrated. People think that sebum is a totally bad thing but this is wrong. Sebum keeps our skin smooth and subtle. Over cleaning skin actually messes up with the normal balance and might cause the skin to produce even more oil. In the new system Proactiv +, the company only decreased the size of the cleansing beads, making the cleanser a little bit less harsh on the irritated skin. Still it contains benzoyl peroxide and glycolic acid. Both ingredients are very drying and dehydrating. Benzoyl peroxide is a harsh chemical that is meant to kill the acne causing bacteria but shouldn’t be used on the entire face. It should be used as a spot treatment. However, I used to use the cleanser twice a day as recommended. The combination of the exfoliating beads, the glycolic acid and the benzoyl peroxide was just too much for my irritated skin to handle. Over the days, I felt my skin getting more dehydrated but I was unable to quit the program. Glycolic acid is another strong ingredient that peels the skin to reveal new skin layers. But the problem is that again, this ingredient should be used once or twice a week, not twice a day as recommended by the producing company. The toner: This toner also contains a 2.5% of benzoyl peroxide that further exfoliates the skin. I admit I was stupid to stick to the system for years, but I wonder how the two dermatologists who developed Proactiv and Proactiv + actually advise to use the ingredients the way they are recommended. It is widely known that too much exfoliation harms the skin and worsens the condition of acne. It is an addition to the harsh and drying system. Again, the problem might not be with the ingredients themselves, but rather how they are recommended for use. Acne is by nature infected broken sensitive skin. Using harsh ingredients like benzoyl peroxide is just a big mistake. It is not supposed to be used on broken skin, yet I used it twice a day, in 2 different products depriving my skin of any chance to heal. The thing is that some types of acne are not oily. Mine was not that oily. It had patches of dry skin on top of the pimples so the system made my already dry dehydrated skin even drier. This actually pushed the skin to produce even more oil to compensate for what it is being deprived from. The moisturizer: This is supposed to be the repairing moisturizing step. But once again, the repair treatment contained salicylic acid. Salicylic acid is another chemical that is meant to exfoliate and peel the skin. Together with benzoyl peroxide, they can fight off any breakout, theoretically. But they were actually way too much for my already irritated and infected skin. My skin was dry and super sensitive. The moisturizer also contained palm oil. This was actually pretty shocking to me. As most people who have acne can be quite allergic to this oil. It also has comedogenicity rating of 4, which means that it can pretty much clog the pores. What really bothers me is the celebrity endorsement behind this product. They hire 5 to 8 celebrities at the time to make the most money. They change their faces all the time to appeal to teenagers and young generations. I really hate that these loved celebrities are used to promote a lie that doesn’t do any good to a problem that bothers a lot of people. I know that when a product is really effective and good, it sells on its own. A company doesn’t need to pay millions of dollars to promote an effective product. You be the judge! Victoria Adam on Why does your ear hurt when you put your cell phone up to your ear? Kadde ivan on Why does your ear hurt when you put your cell phone up to your ear?